Everyone loves to knit for babies-especially when the designs are so appealing. These six sets of hats with matching socks are a joy to knit and give as gifts. 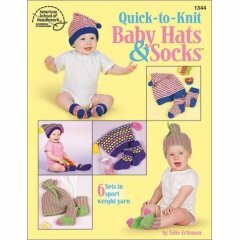 Socks are knit in the round with four needles so they don't have sewn seams and the foot is more comfortable for baby.